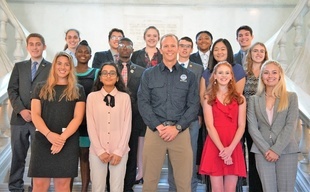 Formed in 2012, the Federal Emergency Management Agency (FEMA) Youth Preparedness Council (YPC) engages members in local and national emergency preparedness projects. Council members serve for two years. In this time, members give the youth perspective on emergency preparedness and share information with their communities. They also meet with FEMA personnel to provide ongoing input on strategies, initiatives, and projects. The YPC brings together high school-age youth leaders from across the country who are interested in emergency preparedness and want to make a difference in their communities. The YPC Summit was held July 17-18 at the American Red Cross National Headquarters (HQ), in Washington, D.C. FEMA holds the YPC Summit annually to acquaint new council members with one another, with current council members, and with FEMA. Notable guest speakers at this year’s Summit included Brock Long, FEMA Administrator; Sherri Brown, President for Humanitarian Services, American Red Cross and other FEMA and American Red Cross leaders. Over 130 staff from FEMA and partners attended to hear the perspectives of the YPC members. Koshland Science Museum also facilitated their Extreme Events Game, a role-playing game that gave YPC members a taste of what it is like to build community resilience. The summit also served as a springboard for announcing new council members. This year’s application was the most competitive yet, and seven new members were selected to join the eight returning members for the 2018-2019 council. Three YPC alumni also attended the summit to share their experience as mentors. Finally, the summit featured the launch of the Prepare with Pedro: Disaster Preparedness Activity Book, designed by FEMA and the American Red Cross. The book tells a story about emergency preparedness and provides specific tips to increase families’ preparedness for disasters. Copies can be ordered for free from the FEMA Publications Warehouse by calling 1-800-480-2520 and ask for publication number P-2005. It is also available as a free download online at www.ready.gov/youth-preparedness. The American Red Cross and FEMA shared the official launch of the Prepare with Pedro: Disaster Preparedness Activity Book with local children from the Annandale Christian Community for Action (ACCA) Child Development Center. The event gave the children the opportunity to learn about emergency preparedness from the Youth Preparedness Council. Audrey Larson is a 14-year-old inventor. For past competitions, she's created glow-in-the-dark pajamas and a device to pet your dog. But this year, after hearing about the school shooting in Parkland, Florida, she felt compelled to focus on a more serious issue. "It's really scary to just think about, and that's kind of what sparked that idea," Larson said. "Some of my friends were having anxiety about being at school and I don't think that's fair to any kid." Larson was looking for an idea to enter into competition, and discussions around school shootings among her peers led her to what she says is her own solution to the problem. She invented a foldable bulletproof wall model that can be used to protect students like her in the event of a school shooting. 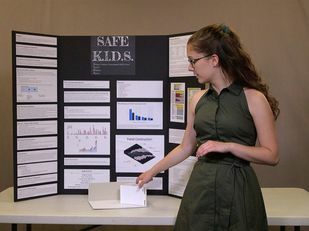 "It's a foldable two-panel barrier that comes out of the wall for kids to hide behind in the event of a lockdown and, ultimately, in the event of a school shooting," Larson told "GMA" about her invention called Safe K.I.D.S. The name stands for Kevlar-cellulose-nanocrystal-AR500-steel Instant Defense System. Larson, who lives in Connecticut, first submitted her idea to the Connecticut Invention Convention, a program for young students to build projects centered on innovation. She won awards there before moving on to the National Invention Convention and Entrepreneurship Expo (NICEE) in Michigan. There Larson competed against other young inventors from all over the country, winning more awards and placing second in her grade level. She is currently working on securing a patent. "It's very relevant, it really addresses the fears that are in school children today," said Mary Lombardo, a judge at the Connecticut Invention Convention and the vice president of engineering and innovation and research at United Technologies Corporation. Lombardo is of two minds when it comes down to the issue. Larson chose the mix of materials that could make the wall including Kevlar to help it withstand shots from guns, even an AR-15 rifle. "From an engineering perspective I felt that it was very well thought-out," Lombardo said. "It was doable and really gave a very simplistic solution to a very difficult and complex social problem." Larson's invention is in line with other bullet-resistant products, including backpacks and clothing that have been marketed to schools and parents in the wake of mass shootings. Questions have been raised about the efficacy of some of these products and more broadly, debates about the best way to keep kids safe. "Her solution solves a couple of very interesting problems in modern classrooms today," said Adam Coughran, who used to work in law enforcement and is president of Safe Kids Inc., a group that provides safety training sessions for educators. Coughran said many classrooms have a lot of windows to let in natural light, and glass isn't bulletproof. Although Coughran called her project "extremely innovative," he pointed out a few things that could hamper the wall in reality. Desks and space issues could get in the way of moving the wall quickly. The wall might also not be large enough to protect everyone in an emergency, especially if other people are running into the room from outside. "Her design and concept can easily be taken and spun off into other designs, such as those panels being slid together like a barn door or sliding glass door to cover an entire wall of windows," Coughran said. Growing up in light of massacres like Parkland and Sandy Hook, Larson believes that her generation will be at the forefront of innovating in this space. "I think that my generation is going to be the change," Larson said. "Millennials and my generation tend to be forward thinkers and tend to be go-getters on some level -- minus our cell phones. ...I feel like the kids of my generation are already talking about this and getting fed up with it." Original article by Oliva Smith and Elisa Tang can be found here. Audience: Anyone interested in learning how to access Federal resources, interactive tools, training, and funding to support your school safety and emergency preparedness efforts. Website: Follow the REMS TA Center on Twitter @remstacenter and email us at info@remstacenter.org for details on how to participate! Description: Are you wondering how to access Federal resources, interactive tools, training, and funding to support your school safety and emergency preparedness efforts? Federal partners are developing a NEW site to ease the process. SchoolPreparedness.gov, the nation's new virtual hub will launch this fall. Along with the REMS TA Center Website, schools, school districts, and their community partners will be able to use this hub to support prevention, protection, mitigation, response, and recovery efforts in their states, territories, and localities. To learn about this new site and how it will supplement rems.ed.gov, join the REMS TA Center and partners every Monday and Friday between August 6 and September 28 for a SchoolPreparedness.Gov Twitter Fest on School Safety and Emergency Preparedness to access resources from Federal partners to support your preparedness efforts. Follow #SchoolSafetyTopicoftheDay on Mondays and #SchoolSafetyResources on Friday to join the conversation. Registration for this event is free and will be recorded for viewing after September 6th. Audience: K-12 school administrators, school emergency managers, school facilities managers, school board members, teachers, representatives of concerned parent groups, building engineers, building professionals, and others interested in improving school natural hazard safety. Topic: An overview of FEMA P-1000 Safer, Stronger, Smarter: A Guide to Improving School Natural Hazard Safety. Description: This webinar will provide an overview of the recently released guidebook, FEMA P-1000, Safer, Stronger, Smarter: A Guide to Improving School Natural Hazard Safety. FEMA P-1000 aims to equip school safety advocates and stakeholders with the information, tools, and resources they need to promote safer schools in their communities and it aims to empower and support decision-makers by providing actionable advice. Topic: This public meeting will be dedicated to the National Advisory Committee on Children and Disasters’ (NACCD) deliberation and vote on the Pediatric Disaster Training Work Group (PDTWG) and Identifying Metrics of Baseline Vulnerability (IMBV) reports. Topic: This public meeting will be dedicated to the NACCD and National Biodefense Safety Board’s deliberation and vote on the ASPR Future Strategies Work Group (FSWG) Report. Description: The National Advisory Council on Children and Disasters (NACCD) has been established to provide advice and consultation to the Health and Human Services Secretary and/or Assistance Secretary for Preparedness and Response on issues related to the medical and public health needs of children as they relate to disasters. Disclaimer: The reader recognizes that the federal government provides links and informational data on various disaster preparedness resources and events and does not endorse any non-federal events, entities, organizations, services, or products. Please let us know about other events and services related to youth preparedness that could be included in future newsletters by contacting FEMA-Prepare@fema.dhs.gov.